Between Global Warming and Global Governance – Concern for Environment is a ‘Hegelian Mind Fck’! Actually, if you look at the coefficients of contributions, things become manifest. Pollution isn't exactly the same thing as global warming, or global cooling, although it certainly impacts them both. Yes, reducing pollution is very important, so is increasing sustainable living, and respecting the power of the earth to create bounties which make our lives both comfortable and pleasurable. There is a self-sustaining and auto re-generation cycle in the eco-system which can withstand some harvesting, some abuse and some pollution, but crossing the threshold can destroy it, or make the replenishment cycle inordinately long. So we must live far below that threshold of tolerance of the environment. This is but a truism. Only a moron would deny any of it, or work against it. They can be safely ignored, if not outright consigned to the looney bin. This isn't what is being talked about here however, although, the disinformationists would like one to think so. This is exactly the conclusion you have unfortunately jumped to as well, despite having read so much of my work and knowing that I am really not idiotic, nor unscientific, nor irrational. Of course, if one asked Mr. Paul Craig Roberts who apportioned the following epithet for me “you are a completely stupid fool, a disgrace to humanity”, it might lead to a different conclusion. But assuming one does not share in that invective, why would one automatically jump to the conclusion that when a man of science challenges global warming, they are denying the obviousness inherent in the question that you posed? I say this not to critique, but just to point out how powerful and successful the disinformation and psyops have been. It is the same Foundations who have seeded the sustainable living mantra as population planning. Care to guess who those might be? It is the same impetus that led to NSSM 200 in 1974 which made population control in poor countries a national security imperative for the United States – the country which excels in harvesting the poor nations of all their natural resources and foisting dictatorships upon them! Care to know who seeded it? I happen to know of the team who got the Nobel Prize on this climate issue last year – they are all imperialists, in on the con-game, just like Hillary Clinton and Al Gore. You can easily find the Pakistani on the team who shared in that Nobel prize amidst much hoopla in Pakistan. Visit his website, and try to determine his axioms in the space of world-government, war on terror, 911. They match the axioms of the state as far as I have been able to tell – and I looked at it last year to check-out what kind of people win a Nobel Prize in climate and environment. When the ruling-elite pushes a mantra, knowing what I know today, my first take begins with searching for their motivation. If one does, what on the surface appears to be a good deed, but with evil intentions and Machiavellian motivations, I have no use for such criminal 'good', and neither should you. Applying that prioritizing, or weightage if you will, principle to this topic of “Global Warming”, one observes that the coefficient, or the bit position, or weightage occupied by the planetary level changes in the solar system due to sun's activity is actually a higher order bit position, than the contribution to the measurements from human activity. And as is entirely obvious from Mr. Gideon Rachman's article why this is politically motivated, the reasons become clear why this confusion is deliberately being created. If you accept the Capitalist conspiracy for world government, as I have described it, and if you accept the NSSM-200 agenda for population reduction as I have also described it, tying in the hand of Rockefeller to the UN and their agenda for population reduction (citations for these statements are in my various essays), then you must realize why the ruling elite wants to control 'life activity', and carbon-credit is their architecture of control! It is somewhat akin to acquiring control of a nation's money supply in the guise of managing the economy better. Few in the public understand why such a control is bad anyway, but those who do try to understand it are thrown layers upon layers of obfuscation. Something similar is happening here. Think of acquiring control of 'carbon-credits' almost equivalent to acquiring control of a nation's money supply! This will control every aspect of sustaining life, just as control of money determines every aspect of sustaining the economy. You name it, between the two of them, it will control it in a world-government. And the first recipient of these controls, the carbon-credit specifically, is the developing world, the Global South, because that is where development must be arrested, and populations thinned out! Just as control of money was first exercised where there was a superfluity of industry and commerce, control of 'carbon-credit' is intended to be exercised where there is a superfluity of populations aspiring to grow their nascent economies! Now, whether there is planetary-level (solar-system level) global warming, or global cooling, is also an entirely orthogonal issue from human contribution to despoiling its environment. Both the former two factors, if they are dominant, tend to occupy the higher order bit relative to human contribution. Wit the Ice-age, followed by the Holocene age. No factories and polluting industries were present then. Unless we explode 10 hydrogen bombs in geostrategic locations to usher in a manmade nuclear winter (and I exaggerate, a smaller number will surely do it), the contribution from coal and cow's emissions (the latter, believe it or not, is also apportioned carbon-credit as I have humorously read somewhere) remain in the lower order bits. They are surely non-zero, and if planetary-level climactic changes in the solar system become normal, as they do between their cyclic extremes, then these lower order bits will become the new higher order bits for management. That's just common sense. So there are two real issues. First is the following scientific measurement – which can be fairly objective – what is the temperature activity in the solar system. For instance, is Mars cooling down or heating up in the past decades. Since there is no known life or industry on Mars, that can readily answer the question quite accurately for earth too. But better and longer running data is available for earth as well, which is why scientists are dissenting as noted in the Senate Minority Report that I have cited in my response to Mr. Gideon Rachman! I do not know of a single lay person who has actually read that report as yet, or its 2007 predecessor report from last year. Most arguments are religiously being fanned out of sheer ignorance, rather than simply asking the quantifiable questions: what is the empirical measurement data (instead of the sociological one)? How was it taken, where was it taken, what time span does it measure, and what is the conclusion? The second real issue is the sociological one that you have alluded to, such as oil consumption, human activity, etc. Please apply those concerns to the Western world first, and specifically to the Americans, not to the entire world, as the affluent Global North is, and has been, the biggest pig. In the Global South, people can hardly make ends meet, they barely subsist on dollar a day wage. And 2/3rd of all humanity lives there. They are routinely harvested of not only what's under their soil, but also what's above it, trees! Thus notice how Rachman has employed the mantra of Global Warming. Even if one assumes for the sake of making the following point that it is the man-made coefficient which is dominant – Gideon Rachman does not advocate that the Western world create a protocol to reduce their gluttonous consumption, but jumps straight to world government! And as everyone knows, the biggest violators of Kyoto, were indeed the Americans themselves. They refused to ratify it! And that, is indeed the second real issue. I am a scientist. I look at data and reach conclusions. I further look at data forensically, and even look at forces that remain hidden, as well as those which are apparent. My writings are testimony of that. I have no reason to obfuscate or deny any of these factors. Whereas those who are pushing them, have a politically motivated agenda, as has already been shown. Just as the scientists at NIST fudged the reports on how the towers fell, and Popular Mechanics dished out disinformation on how it could have happened, it is already in ample evidence that science is permeated with politics, like every other human endeavor! So before looking at the scientists' results and reading their papers, look at their motivation. Whom do they shill for? I would be happy to address further questions from anyone. This topic does require doing substantial due diligence before forming opinions. Remember that the subject matter is no less laden with deception, than any other topic which relates to world government, from 'war on terror' to 'money as debt' to the Federal Reserve System. You can't simply pick up a text-book (or 10 books) on any of these topics and assume what you are reading is entirely correct, as one normally does at a university in a typical science curriculum. There, the measurement of learning is often how accurately one has understood what the books are teaching, and one gets an 'A' for perfect recollection and/or solving problems based on the axioms in the books which are rarely if ever challenged. The axioms are taken on faith and assumed correct. One takes F=MA for granted. Here, you have to assume that the text-books/articles/literature/Nobel-Prizes could also be lying, telling half-truths through omissions and distortions, or spinning politically motivated mantras as axioms upon which all further discussions are being based. Just like 911 and the 'war on terror'. That is quite a difference in approach to studying! It requires one being a Sherlock Holmes trying to solve a complex puzzle laden with deliberate red herrings more than being a naïve grad-student! Hope this fleshes out all the dimensions of the question. For the simple reason that Global Warming mantra is to be Machiavellianly employed to control humanity, and we have even seen a glimpse of that in the Financial Times editorial, I oppose it. If it turns out that the human emissions are the most significant bit, let the affluent nations bring themselves down to the level of poor nations before demanding from them to do anything. After all, the ruling-elite are pitching that we are one ship of humanity and global control is necessary. Let not the upper-deck live in plunderous wealth while the lower decks are thrown to the sea! That is only fair for something as intimately shared as the environment! In the dismantling of the core lie above of whether or not global warming is man-made and what really lies behind that boogeyman, we haven't even touched upon the subject of Geo Engineering. This is to deliberately engineer the earth's weather and artificially induce global climate change to precipitate the climate crisis in order to lend the mantra du jour some legitimacy – be it global warming, or global cooling, or some yet to be thought of even more frightening crisis such as global earthquakes, or other more imaginative earth-centric or earth-impacting catastrophes, which can give new lease on life to these mantras to continue pursuing the real agenda behind it all in the pretext of fighting these global crises. Just like the mantra of war on terror. We already observe how new global enemies are inexplicably birth-panged in the blood of the ordinary people to give this well-worn mantra a new lease on its life. Whether the climate change boogeyman is crafted in mantras alone, or in mantras backed by manufactured crisis such as through Geo Engineering or extra-terrestrial engineering, in order to fabricate the data to continually fuel that frightening narrative, the outcome is singular: the introduction of carbon credit by which to limit and control population growth. When you limit carbon emissions, you automatically limit production, and consequently control population growth. We already know without doubt that population reduction is a ruling agenda as per NSSM-200 in which Dr. Henry Kissinger stated, as the then Secretary of State, that rise of third world population was a threat to the National Security of the United States. We also know that all the news related to climate and weather is controlled and disseminated to the newsmedia from a private organization called Weather Central in which the House of Rothschild purchased a 70% majority stake in 2011. The Wall Street Journal headlined it: Even the Rothschilds Are Weather Obsessed, 'The couple’s private-investment company, E.L. Rothschild LLC, is slated to acquire 70% of Weather Central, which provides weather forecasting services and graphics to local television stations and TV programs such as ABC’s “Good Morning America.”' http://blogs.wsj.com/deals/2011/01/31/rothschilds-buy-majority-stake-in-weather-central/ (January 31, 2011). Why is the banking cabal so interested in providing that service to mankind? This is what Sir Evelyn Rothschild said: “As a family, the Rothschilds have always been dedicated to the utmost quality of our products and services. With respect to our investments, we focus on entering into long-term partnerships with people who share our values. As weather becomes more extreme around the planet, with greater human and financial ramifications, we believe that Weather Central will play a major role in mitigating damage and improving lives. This is important to the Rothschilds, as it is to Weather Central. We are proud of our new partnership with them.”, http://www.businesswire.com/news/home/20110131007054/en/E.L.-Rothschild-LLC-Acquires-Majority-Stake-Weather (January 31, 2011). The interconnection of common threads of interest of the same banking cabal is open for all to see. First they controlled the money supply via acquiring monopoly control over nations' central banks and the issuance of their own national currency as a debt secured by the taxation levied upon the peoples of these nations. The same cabal is now seeking to control all humanity via the global carbon credit scam which will give them control over all means of production, including of human beings. Thus it makes sense for the cabal to control the primary source of all news and propaganda dissemination on weather and climate, just as they already control other news dissemination sources and news agencies such as the Associated Press. There is an extensive bibliography on this subject, the pathetic unfamiliarity with which leads to the disbelief and confusion among the public as well as among their mild-mannered gallant stewards across the board, from science to politics, that there is a diabolical conspiracy afoot to control mankind. None dare call it conspiracy. Which is why, the popes and the laity alike are easily led to buy one control regime after another in the name of some higher purpose. Such as, securing their nation from this or that threat, danger, crisis, catastrophe or calamity. To secure mankind from the threat of the terrorists, the public has been made to accept the war on terror and the concomitant police-states that virtually all of mankind now live in. To secure mankind from climate change, all governments are now being goaded and directed to accept legal controls on carbon emissions. This will soon translate to the number of human beings and factories on the planet that can be sustained in eco-balance of the new manufactured reality of climate change! This not so hidden motivation is in plain sight. It is not a classified state secret. And yet, incredibly, as in all matters of controlling the public mind by way of omission, the most effective form of propaganda, there is absolute silence on any mention of Geo Engineering in the calculus of climate change among the very officialdom who are leading the charge on limiting carbon emissions. No word in the press, or among the academics, or among the pundits and the pulpits. The powers that be had long purchased their own scientists, prostitutes and pressman, not to forget the politicians and the robes, to both spin the mantra of global warming, and to participate in the fruits and labors of Geo Engineering. And they have purchased the primary source of narrative distribution on this subject as well. To learn more about Geo Engineering, try searching for that term in Google. The first item that crops up is in fact this Newspeak definition of Geo Engineering to make it appear benign: Geoengineering is the artificial modification of Earths climate systems through two primary ideologies, Solar Radiation Management (SRM) and Carbon Dioxide Removal (CDR). The new propaganda lines for useful idiots to promulgate to the masses to get them to accept this whole scam appears to be by way of the technique of infamy, invent two or more lies instead of just one, and have the public vigorously debate which of them is true or the better alternative: the de-carbonization of environment for sustainable development by carbon credit vs. SRM and CDR ideologies to manage the earth's climate for the greater benefit of the public. All very scientifically couched of course. Weather modification and control techniques have countless patents published on the US patent website that are open for anyone to study. Global supremacy in weather modification techniques has openly been declared time and again as having military dimensions and its complete mastery a military objective. None of this is ever mentioned in the annual climate change conferences where the political leaders of the world legally sign away their grandchildren's future with great fanfare of saving the earth. The following two documentaries dive deeply into the subject of Geo Engineering for the lay person. The excellent website http://geoengineeringwatch.org is a stupendous resource for further due diligence. Finally, not to forget that the environment, and specifically climate and pollution, are mentioned in the 1967 Report from Iron Mountain published by The Dial Press, as the alternate means of corralling human behavior based on fear in the absence of the menace of war corralling mankind. It stated: “The existence of an accepted external menace, then, is essential to social cohesiveness as well as to the acceptance of political authority. The menace must be believable, it must be of a magnitude consistent with the complexity of the society threatened, and it must appear, at least, to affect the entire society.” If the overarching agenda is to form global political authority in a one-world government, even if just for a moment the skeptic may accept that hypothesis, then, what better global menace than the environment which threatens the whole world! It is easily made believable, and especially if the ecological menace can be coincided with natural ecological / climate cycles due to sun's activity, and the requisite political as well as cultural propaganda employing credible “experts” is brought to bear on the principal cause being man-made. After fait accompli, it would be a moot point whether the menace was politically invented, or natural or man-made. This is what the shockingly uncanny report, commissioned in 1961-62 at the height of the Cold War in the aftermath of the Cuban missile crisis when it was already being anticipated by the powers that be that it would soon end with nary a new enemy in sight, stated in its Section 6, Substitutes for the Function of War, for Political alternatives to war. The reader should be mindful that this study is well over a half century old. Whether real or fictionalized political treatise, it is uncannily in the footprints of Machiavelli's The Prince, the diabolical political blueprint for political authority to engineer consent from the public mind for their own behavior control by politically structured means: “Nevertheless, an effective political substitute for war would require "alternate enemies," some of which might seem equally farfetched in the context of the current war system. It may be, for instance, that gross pollution of the environment can eventually replace the possibility of mass destruction by nuclear weapons as the principal apparent threat to the survival of the species. Poisoning of the air, and of the principal sources of food and water supply, is already well advanced, and at first glance would seem promising in this respect; it constitutes a threat that can be dealt with only through social organization and political power. But from present indications it will be a generation to a generation and a half before environmental pollution, however severe, will be sufficiently menacing, on a global scale, to offer a possible basis for a solution.” Note the coincidence of that last sentence with the emergence of the Global Warming mantra which was kicked off in the major league mainstream by former vice president Al Gore on precisely that timeline. Also not to forget that directly upon the heels of the Machiavellian prescriptions laid out in the Report from Iron Mountain, came the infamous Club of Rome's actual recipe to propagandize the ecological global threat. In its carefully worded report on environment and habitat of Man on earth titled: The First Global Revolution, 1991, the Club of Rome authors, Alexander King and Bertrand Schneider, made global warming and climate change the new hard menace to corral mankind towards the behavior and attitude change desired by the powers that be: “The Common enemy of humanity is Man: In searching for a common enemy against whom we can unite, we came up with the idea that pollution, the threat of global warming, water shortages, famine and the like, would fit the bill. In their totality and their interactions these phenomena do constitute a common threat which must be confronted by everyone together. But in designating these dangers as the enemy, we fall into the trap, which we have already warned readers about, namely mistaking symptoms for causes. All these dangers are caused by human intervention in natural processes, and it is only through changed attitudes and behavior that they can be overcome. The real enemy then is humanity itself.” --- Ch 5, The Vacuum, pg 75 (pg 86 / 184 in PDF: https://archive.org/stream/TheFirstGlobalRevolution#page/n85/mode/2up . Again, also not to forget that directly on the heels of the Club of Rome report, came the United Nations Agenda 21 in 1992. In the United Nations Conference on Environment and Development (UNCED), also known as the Rio de Janeiro Earth Summit, held in Brazil in June 1992, virtually all member countries of the UN signed on to this Agenda 21, including the United States of America. Its prime-mover was the 1991 Club of Rome recommendations that had identified all the menaces facing humanity including humanity itself, rectification of all of which suddenly became internationally endorsed global policies known as United Nations Agenda 21. It is an actual play by play rule book for attitude and behavior modification in a massive global reset and reboot that covers the gamut of present day organizational combines from international to national to districts to cities to local to neighborhood and community levels. The United Nations Agenda 21 is intended to force mankind to make broad changes in its attitudes, behaviors, and lifestyles in accordance with the wishes of the powers that be. The macro social change is to be wrought, and is being brought about, in baby steps, legally, just as in the Global Warming / Climate Change scam, with the blunt force of hammer unto anvil by international treaties, global laws, and local statutes. And just as for international agreement on limiting carbon emissions under the magical “climate change” propaganda cover, United Nations Agenda 21 is cloaked in the magical propaganda word “sustainable”, as in Sustainable Development, in order to make it appear to be in the public's own best interest. Only nutters, fools, crazies and evil-doers would ever argue with “Sustainable Development”! And therefore, any dissent and public resistance to draconian and austerity measures in the name of “sustainable” is easily managed and dispensed with by labels such as kooks, crazies, mentally ill, and when all else fails, eco-terrorists with invitation to enjoy state hospitality centers. The motivation for the mechanics of global warming / climate change employing crafty pseudo science cannot be fully appreciated in isolation to its big brother umbrella, the United Nations Agenda 21. The broader picture of full spectrum global control of humanity easily emerges once Global Warming / Climate Change is understood as part of the overall propaganda system based on this and that threat to lend justification to the madness of Agenda 21. There is a systematic method to that madness once the layers of green masks are peeled off. Agenda 21 is designed to corral all mankind in all nations of the world into a state of existence that the world's public would, of their own volition, never select for themselves. Therefore, the objectives of United Nations Agenda 21 are to be achieved by stealth, in incremental stages, in the pretext of solving this and that menace. The menace is manufactured, or exponentially amplified, with propaganda cover expositing full spectrum of deceit from clever half-truths to outright lies that most people without much thinking would immediately agree with. Such as “Sustainable Development”. Who in their right mind would not like the word “sustainable” as the panacea for the global threats of rising pollution, rising population explosion, rising food shortages, rising water shortages, rising famine, increased aridity of land, increasing terrorism, frequent pandemics, fear of global warming causing rising sea levels and destroying coastal cities, then fear of global cooling freezing out agriculture and rain forests, etc. etc. etc. The powers that be are only constrained by the imagination of the Rand Corporation and other think-bodies such as the Rockefeller Foundation to come up with new threat scenarios and menaces from where the Rand expert group assembled at Iron Mountain had left off in 1962. Agenda 21 continues on the same axis as the global warming scam and posits man's very existence on the face of the earth to be a dire threat to “Gaia's” natural processes even beyond his carbon emissions. The principle is directly taken from the aforementioned handbook of social control in which the Club of Rome authors hath stated (repeating for emphasis): “All these dangers are caused by human intervention in natural processes, and it is only through changed attitudes and behavior that they can be overcome. The real enemy then is humanity itself.” The solution to this enemy is United Nations Agenda 21 for Sustainable Development! This Hegelian Dialectic is far more sophisticated than others that have come before it within our own lifetimes and requires considerable acuity of mind to comprehend. An acuity which is enfeebled by dumbing down the public mind and occupying it between bread and circuses. See the Report on Mighty Wurlitzer [17n] to understand how that is most cunningly accomplished through perception control. See Hegelian Dialectic for Dummies [17p] for understanding that mechanism. The core propaganda spiel of Agenda 21 is premised upon the necessity of preserving earth's natural processes from man's incessant encroachment, unbridled harvesting, and unbridled despoiling, through his attitude and behavior change under “sustainable” living. The “Gaia”, or mother earth, is deemed supreme, and Man, the common man that is, is deemed not just one among its many inhabitants, but also the worst one, and therefore, he must be treated like game in a reservation; he must be guided, shepherded, profiled, controlled, and culled. All this sounds grotesque and far-fetched, but that is indeed the underlying premise of the tiny elite who want to own and rule the earth in one-world government. Combined with carbon-credit and its repercussions of what man may legally eat, grow, produce, and if and how many he may procreate, under the overarching United Nations Agenda 21, where man may legally live, how much space he may legally occupy, and where and when he may legally travel, all under full surveillance, is intended to make a global prison state for hoi polloi. Fable and reality are merging rapidly. Or at least being enabled. It all started with the bogus alarm of man-made global warming, moved to the nice sounding idea of sustainable development, and is intended to end up in dystopic world police-state. This is the real alarm. The real man-made menace. Not Global Warming / Climate Change. Dr Michael Mann of the Department of Geosciences, University of Massachusetts was the primary author of the GRL paper, and in one scientific coup overturned the whole of climate history . Using tree rings as a basis for assessing past temperature changes back to the year 1,000 AD, supplemented by other proxies from more recent centuries, Mann completely redrew the history, turning the Medieval Warm Period and Little Ice Age into non-events, consigned to a kind of Orwellian `memory hole' . Fig.4 shows Mann's revision of the climatic history of the last millennium. From the diagram, the Medieval Warm Period and Little Ice Age have disappeared, to be replaced by a largely benign and slightly cooling linear trend in climate - until 1900 AD. At that point, Mann completed the coup and crudely grafted the surface temperature record of the 20th century (shown in red and itself largely the product of urban heat islands) onto the pre-1900 tree ring record. The effect was visually dramatic as the 20th century was portrayed as a climate rocketing out of control. The red line extends all the way to 1998 (Mann's `warmest year of the millennium'), a year warmed by the big El Niño of that year. It should be noted that the surface record is completely at variance with the satellite temperature record . Had the latter been used to represent the last 20 years, the effect would have been to make the 20th century much less significant when compared with earlier centuries. As a piece of science and statistics it was seriously flawed as two data series representing such different variables as temperature and tree rings simply cannot be credibly grafted together into a single series. This never happened with Mann's `Hockey Stick'. The coup was total, bloodless, and swift as Mann's paper was greeted with a chorus of uncritical approval from the greenhouse industry. Within the space of only 12 months, the theory had become entrenched as a new orthodoxy. The ultimate consummation of the new theory came with the release of the draft of the Third Assessment Report (TAR-2000)  of the IPCC. Overturning its own previous view in the 1995 report, the IPCC presented the `Hockey Stick' as the new orthodoxy with hardly an apology or explanation for the abrupt U-turn since its 1995 report. They could not even offer any scientific justification for their new line. Within months of the IPCC draft release, the long-awaited draft U.S. `National Assessment' Overview document featured the `Hockey Stick' as the first of many climatic graphs and charts in its report, affirming the crucial importance placed in it by the authors and by the industry at large. This is not an esoteric theory about the distant past, marginal to the global warming debate, but rather is a core foundation upon which a new publicity offensive on global warming is being mounted. Two issues are raised by Mann's `Hockey Stick'. 1) Why did the climate community fail to critically review the validity of the new theory, indeed to uncritically embrace it in its entirety? and Little Ice Age, and thus avoid the problem of the role of the sun in climate history? Tree rings are the primary proxy behind the `Hockey Stick', particularly the earlier part of the millennium. Tree rings are only laid during the growing season, not the whole year, and so they tell us little or nothing about annual climate. For example, this year (2000) there was a warm winter and early spring in the north-eastern USA, followed by an unusually cool summer and fall. Since the two events are largely self-cancelling, the year may finish as fairly average, but the tree rings would only record the cool summer and thus give a completely false impression of the full-year temperature. Tree rings do not even record night temperatures since photosynthesis only occurs in the daytime. Yet winter and night temperatures are an essential component of what we understand by the concept `annual mean temperature'. All a tree ring can tell us is whether the combined micro-environmental conditions during the growing season were favourable to tree growth or not. This is because tree rings are influenced by numerous factors other than temperature, such as rainfall, sunlight, cloudiness, pests, competition, forest fires, soil nutrients, frosts and snow duration. Thus they are not even a good daytime temperature proxy for the few months of the growing season. Other proxies such as isotopes in coral, ice, minerals and sediments are vastly superior. Trees only grow on land. Since 71% of the planet is covered by oceans, seas and lakes, tree rings can tell us nothing about the maritime climate, even though the oceans are known to be the prime determinants of climate conditions throughout the world. In other words, historical climate simply cannot be described without taking into account the winter and adjacent months temperatures, night-time temperatures, and ocean sea surface temperatures. Tree rings, no matter how carefully they are measured and examined, cannot provide information on any of these key parameters, and are a doubtful proxy even for daytime temperatures on land in summer. A final weakness arises when calibrating the tree rings against temperature. When measuring the width or density of a tree ring, exactly what temperature is represented by that measurement? This can only be determined by calibrating recently laid rings against known temperatures that existed at the time. Even this is problematic as the `known temperatures' can mean using a temperature series seriously contaminated by heat island and other local errors. If the calibrating temperatures are wrong, the whole tree ring temperature reconstruction for the distant past is also compromised. There are many sub-specialties within the greenhouse sciences, `dendrochronology' (study of tree rings) being one of them. That particular sub-branch has both prospered and been highly successful in projecting itself to the broader climatic community on the basis of what is a very weak proxy. In respect of Europe and Greenland, the IPCC and `National Assessment' do not challenge the existence of the Medieval Warm Period and Little Ice Age as they are too well recorded in other proxy indicators and historical accounts of the time. Instead, these events are now presented as being purely local to Europe and Greenland, but completely absent elsewhere in the world. In general, the greenhouse industry disregards historical evidence, claiming them to be merely `anecdotes'. However, the idea that historical evidence can be easily dismissed as `anecdotes' in favor of questionable proxies like tree rings is to suggest that professional historians cannot be trusted to be objective. Objectivity comes from how the evidence is treated, not the nature of the evidence itself. Historians can be just as objective as any scientist. Indeed most of them regard their work as science. As a prominent Finnish scientist remarked about a historical military event in his country's distant history, "if `anecdotal' ice is thick enough to carry a whole army, we can infer the ice was both thick and durable as an objective conclusion based on a documented historical fact." Similar inferences can be made elsewhere in the world. For example, if whole populations suffered from drought-induced famine, we can infer a reduced rainfall. We don't need the proxies to tell us - indeed they might even mislead us. When a society is ravaged by great floods, we can infer increased precipitation. When the Polynesians were able to populate the Pacific Islands by outrigger boats, we can make climate inferences there too. The fact that the greenhouse sciences were reluctant to declare the Medieval Warm Period and Little Ice Age as non-events in Europe suggests that the historical evidence was too overwhelming to make selected proxies believable. Such a claim for Europe would have been met with derision. While greenhouse science may regard proxies as being more objective than historical `anecdotes', that viewpoint is only shared among that peer group. The wider academic community, governments, and public opinion (the most important peer group of all) will give much more credibility to well-researched historical evidence. If the IPCC were genuine about the need for full information about millennial climate, they would involve historians everywhere to research their resources to determine past climates as observed and experienced by human societies. The fear of some global warming proponents is that the historians would indeed find the Medieval Warm Period and Little Ice Age all over the world and that governments and public opinion would accept the historical accounts over tree rings. In Mann's original formulation, the `Hockey Stick' only applied to the Northern Hemisphere. However, the U.S. National Assessment treated it as if it were a global history by reproducing Mann's original graph with a new title implying it has global rather than hemispheric application . This revised version of Mann's graph is shown in Fig.5. The `National Assessment' disregarded these issues and threw its full weight behind the new theory with this stark assertion. "Our results suggest that the latter 20th century is anomalous in the context of at least the past millennium. The 1990's was the warmest decade, and 1998 the warmest year, at moderately high levels of confidence". The statement was dramatic and uncompromising, with barely a hint of the uncertainties inherent in his whole analysis. There was no dissent - except from those scientists who were already on record as being sceptical of global warming anyway. The final claim, that `1998 was the warmest year of the millennium' was exactly what the climate change industry wanted to hear in the run-up to the next round of conferences on the Kyoto Protocol. It is now clear that the climate history of the northern hemisphere and the globe as a whole bears no similarity whatever to that portrayed by Mann's `Hockey Stick'. It is inconceivable that two major climatic events of the last millennium, the Medieval Warm Period and Little Ice Age, could be observed at the same points in time in such varied locations and with such a variety of proxies, around the world and yet be missed by Mann's study. One possible explanation for this discrepancy is that tree rings are inappropriate as temperature proxies, something most dendrochronologists are reluctant to acknowledge. The question must then be asked, why do people who claim scientific credentials in the field cling so tenaciously to a characterization of past climate that is so patently false? Why was there so little challenge to the Mann theory among his peers? Why is there collective denial about the role of the sun when published and peer-reviewed evidence from solar scientists demonstrates a clear relationship between solar change and climate change? A booklet titled "On Being a Scientist: Responsible Conduct in Research" , published by the National Academy of Science in 1995, provides us with a well-presented set of criteria to guide the conduct of scientists as they navigate their way through the difficult choices they have to make in the way they conduct themselves ethically. "The fallibility of methods is a valuable reminder of the importance of skepticism in science. Scientific knowledge and scientific methods, whether old or new, must be continually scrutinized for possible errors. Such skepticism can conflict with other important features of science, such as the need for creativity and for conviction in arguing a given position. But organized and searching skepticism as well as an openness to new ideas are essential to guard against the intrusion of dogma or collective bias into scientific results." Here, scepticism is held up as a virtue, in contrast with the hostile treatment afforded to sceptics in the climate sciences. But we also have this cogent warning against dogma and collective bias intruding into a science. This caution is directly applicable to those involved in climate change research as they have demonstrated numerous times a collective bias in their work, a bias that must inevitably contaminate the peer review process itself. "In fulfilling these responsibilities scientists must take the time to relate scientific knowledge to society in such a way that members of the public can make an informed decision about the relevance of research. Sometimes researchers reserve this right to themselves, considering non-experts unqualified to make such judgments. But science offers only one window on human experience. While upholding the honor of their profession, scientists must seek to avoid putting scientific knowledge on a pedestal above knowledge obtained through other means." This is a direct criticism of 'scientism', a belief held by many scientists that knowledge not acquired by professional scientists is knowledge not worth having. Scientism is an affront to free people everywhere as it denies the right of the public to judge the work of science, even where this work is funded from taxpayer's money. It is a formula that holds scientists above criticism, and unaccountable to anyone but their own peers. It is an anti-democratic view of the world and is clearly opposed by the National Academy. At the time he published his `Hockey Stick' paper, Michael Mann held an adjunct faculty position at the University of Massachusetts, in the Department of Geosciences. He received his PhD in 1998, and a year later was promoted to Assistant Professor at the University of Virginia, in the Department of Environmental Sciences, at the age of 34. He is now the Lead Author of the `Observed Climate Variability and Change' chapter of the IPCC Third Assessment Report (TAR-2000), and a contributing author on several other chapters of that report. The Technical Summary of the report, echoing Mann's paper, said: "The 1990s are likely to have been the warmest decade of the millennium, and 1998 is likely to have been the warmest year." Mann is also now on the editorial board of the `Journal of Climate' and was a guest editor for a special issue of `Climatic Change'. He is also a `referee' for the journals Nature, Science, Climatic Change, Geophysical Research Letters, Journal of Climate, JGR-Oceans, JGR-Atmospheres, Paleo oceanography, Eos, International Journal of Climatology, and NSF, NOAA, and DOE grant programs. (In the `peer review' system of science, the role of anonymous referee confers the power to reject papers that are deemed, in the opinion of the referee, not to meet scientific standards). He was appointed as a `Scientific Adviser' to the U.S. Government (White House OSTP) on climate change issues. Mann lists his `popular media exposure' as including - "CBS, NBC, ABC, CNN, CNN headline news, BBC, NPR, PBS (NOVA/FRONTLINE), WCBS, Time, Newsweek, Life, US News & World Report, Economist, Scientific American, Science News, Science, Rolling Stone, Popular Science, USA Today, New York Times, New York Times (Science Times), Washington Post, Boston Globe, London Times, Irish Times, AP, UPI, Reuters, and numerous other television/print media" . No Need to Panic About Global Warming – The Wall Street Journal, op-ed January 27, 2012: There's no compelling scientific argument for drastic action to 'decarbonize' the world's economy; and Concerned Scientists Reply on Global Warming – The Wall Street Journal, op-ed February 21, 2012: The authors of the Jan. 27 Wall Street Journal op-ed, 'No Need to Panic about Global Warming,' respond to their critics. Zahir's Take: Full text from both these WSJ op-eds reproduced below – signed by 16 prominent scientists in the field, including the well known MIT Professor, Dr. Richard S. Lindzen, see footnote  below. What is missing in the two op-eds by these brilliant scientists despite their most perceptive insight: “One reason to be on guard, as we explained in our original op-ed, is that motives other than objective science are at work in much of the scientific establishment.”, is any explicit indication of the real motivation behind the fiction of Global Warming apart from “but a good place to start is the old question "cui bono?" Or the modern update, "Follow the money."”. They inexplicably fail to see the elephant in the bedroom, that the exercise of so much state power behind fabrication of this pretext is primarily intended for ushering in the global carbon credit scam as a means of full spectrum control over human life. Nevertheless, putting the non junk hard science of these dissenting scientists with the political science that drives the hard road to world order, also coherently explains why billionaire Bill Gates, the retired founder of Microsoft, is so altruistically pursuing his global vaccination program for reducing the earth's population in the Third World by drawing upon the fiction of Global Warming and the alarmist mantra of reducing CO2 emissions to save earth. Watch Bill Gates' presentation at TED talk, read these op-eds by the non junk scientists, and the ‘Hegelian Mind Fck’ behind the concern for environment, the concern for over population, and the concern for global health with its concomitant legally enforced vaccination regimens in the Third World nations, all begin to make sense. The entire house of cards of fear-mongering is built on the single fiction of Global Warming. Take away that fiction and what remains? A new fiction will be invented to create a new pretext for the same outcome. Now the WSJ Opeds have a context that lends a whole new perspective that is greater than the sum of what's stated in each one of these signed letters from prominent climate scientists. The fact is that CO2 is not a pollutant. CO2 is a colorless and odorless gas, exhaled at high concentrations by each of us, and a key component of the biosphere's life cycle. Plants do so much better with more CO2 that greenhouse operators often increase the CO2 concentrations by factors of three or four to get better growth. This is no surprise since plants and animals evolved when CO2 concentrations were about 10 times larger than they are today. Better plant varieties, chemical fertilizers and agricultural management contributed to the great increase in agricultural yields of the past century, but part of the increase almost certainly came from additional CO2 in the atmosphere. Why is there so much passion about global warming, and why has the issue become so vexing that the American Physical Society, from which Dr. Giaever resigned a few months ago, refused the seemingly reasonable request by many of its members to remove the word "incontrovertible" from its description of a scientific issue? There are several reasons, but a good place to start is the old question "cui bono?" Or the modern update, "Follow the money." If elected officials feel compelled to "do something" about climate, we recommend supporting the excellent scientists who are increasing our understanding of climate with well-designed instruments on satellites, in the oceans and on land, and in the analysis of observational data. The better we understand climate, the better we can cope with its ever-changing nature, which has complicated human life throughout history. However, much of the huge private and government investment in climate is badly in need of critical review. Editor's Note: The authors of the following letter, listed below, are also the signatories of "No Need to Panic About Global Warming," an op-ed that appeared in the Journal on January 27. This letter responds to criticisms of the op-ed made by Kevin Trenberth and 37 others in a letter published Feb. 1, and by Robert Byer of the American Physical Society in a letter published Feb. 6. In this respect, an important gauge of scientific expertise is the ability to make successful predictions. When predictions fail, we say the theory is "falsified" and we should look for the reasons for the failure. 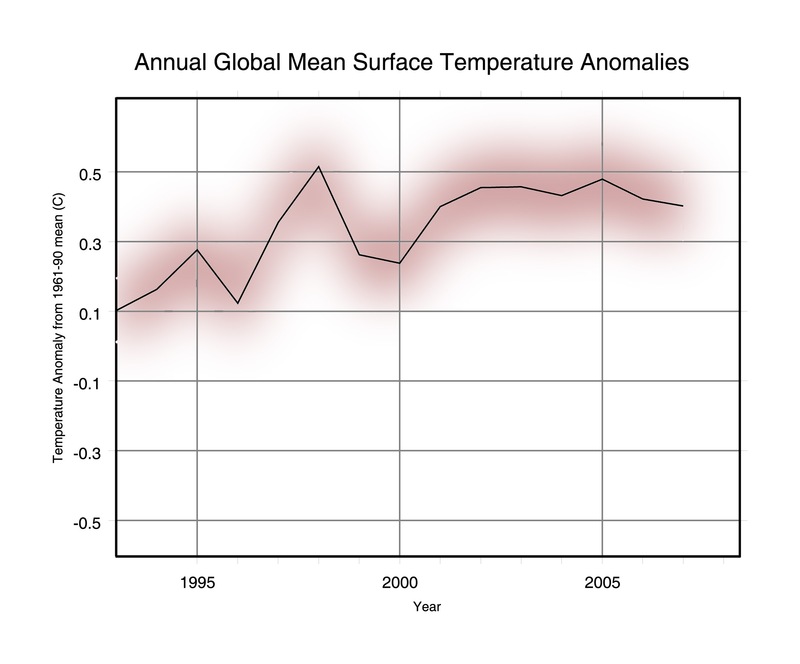 Shown in the nearby graph is the measured annual temperature of the earth since 1989, just before the first report of the Intergovernmental Panel on Climate Change (IPCC). Also shown are the projections of the likely increase of temperature, as published in the Summaries of each of the four IPCC reports, the first in the year 1990 and the last in the year 2007. From the graph it appears that the projections exaggerate, substantially, the response of the earth's temperature to CO2 which increased by about 11% from 1989 through 2011. Furthermore, when one examines the historical temperature record throughout the 20th century and into the 21st, the data strongly suggest a much lower CO2 effect than almost all models calculate. The Trenberth letter tells us that "computer models have recently shown that during periods when there is a smaller increase of surface temperatures, warming is occurring elsewhere in the climate system, typically in the deep ocean." The ARGO system of diving buoys is providing increasingly reliable data on the temperature of the upper layers of the ocean, where much of any heat from global warming must reside. But much like the surface temperature shown in the graph, the heat content of the upper layers of the world's oceans is not increasing nearly as fast as IPCC models predict, perhaps not increasing at all. Why should we now believe exaggerating IPCC models that tell us of "missing heat" hiding in the one place where it cannot yet be reliably measured—the deep ocean? Trenberth et al. tell us that the managements of major national academies of science have said that "the science is clear, the world is heating up and humans are primarily responsible." Apparently every generation of humanity needs to relearn that Mother Nature tells us what the science is, not authoritarian academy bureaucrats or computer models. One reason to be on guard, as we explained in our original op-ed, is that motives other than objective science are at work in much of the scientific establishment. All of us are members of major academies and scientific societies, but we urge Journal readers not to depend on pompous academy pronouncements—on what we say—but to follow the motto of the Royal Society of Great Britain, one of the oldest learned societies in the world: nullius in verba—take nobody's word for it. As we said in our op-ed, everyone should look at certain stubborn facts that don't fit the theory espoused in the Trenberth letter, for example—the graph of surface temperature above, and similar data for the temperature of the lower atmosphere and the upper oceans. What are we to make of the letter's claim: "Climate experts know that the long-term warming trend has not abated in the past decade. In fact, it was the warmest decade on record." We don't see any warming trend after the year 2000 in the graph. It is true that the years 2000-2010 were perhaps 0.2 C warmer than the preceding 10 years. But the record indicates that long before CO2 concentrations of the atmosphere began to increase, the earth began to warm in fits and starts at the end of the Little Ice Age—hundreds of years ago. This long term-trend is quite likely to produce several warm years in a row. The question is how much of the warming comes from CO2 and how much is due to other, both natural and anthropogenic, factors? There have been many times in the past when there were warmer decades. It may have been warmer in medieval times, when the Vikings settled Greenland, and when wine was exported from England. Many proxy indicators show that the Medieval Warming was global in extent. And there were even warmer periods a few thousand years ago during the Holocene Climate Optimum. The fact is that there are very powerful influences on the earth's climate that have nothing to do with human-generated CO2. The graph strongly suggests that the IPCC has greatly underestimated the natural sources of warming (and cooling) and has greatly exaggerated the warming from CO2. The Trenberth letter states: "Research shows that more than 97% of scientists actively publishing in the field agree that climate change is real and human caused." However, the claim of 97% support is deceptive. The surveys contained trivial polling questions that even we would agree with. Thus, these surveys find that large majorities agree that temperatures have increased since 1800 and that human activities have some impact. But what is being disputed is the size and nature of the human contribution to global warming. To claim, as the Trenberth letter apparently does, that disputing this constitutes "extreme views that are out of step with nearly every other climate expert" is peculiar indeed. The continued efforts of the climate establishment to eliminate "extreme views" can acquire a seriously threatening nature when efforts are directed at silencing scientific opposition. In our op-ed we mentioned the campaign circa 2003 to have Dr. Chris de Freitas removed not only from his position as editor of the journal Climate Research, but from his university job as well. Much of that campaign is documented in Climategate emails, where one of the signatories of the Trenberth et al. letter writes: "I believe that a boycott against publishing, reviewing for, or even citing articles from Climate Research [then edited by Dr. de Freitas] is certainly warranted, but perhaps the minimum action that should be taken." Or consider the resignation last year of Wolfgang Wagner, editor-in-chief of the journal Remote Sensing. In a fulsome resignation editorial eerily reminiscent of past recantations by political and religious heretics, Mr. Wagner confessed to his "sin" of publishing a properly peer-reviewed paper by University of Alabama scientists Roy Spencer and William Braswell containing the finding that IPCC models exaggerate the warming caused by increasing CO2. Turning to the letter of the president of the American Physical Society (APS), Robert Byer, we read, "The statement [on climate] does not declare, as the signatories of the letter [our op-ed] suggest, that the human contribution to climate change is incontrovertible." This seems to suggest that APS does not in fact consider the science on this key question to be settled. Yet here is the critical paragraph from the statement that caused the resignation of Nobel laureate Ivar Giaever and many other long-time members of the APS: "The evidence is incontrovertible: Global warming is occurring. If no mitigating actions are taken, significant disruptions in the Earth's physical and ecological systems, social systems, security and human health are likely to occur. We must reduce emissions of greenhouse gases beginning now." No reasonable person can read this and avoid the conclusion that APS is declaring the human impact "incontrovertible." Otherwise there would be no logical link from "global warming" to the shrill call for mitigation. Don’t be fooled. The agenda for which global warming was constructed has obviously nothing to do with weather, climate, or environment. But with full-spectrum control of human life through the architecture of carbon-credit. And that agenda can be pushed with many more mantras, including still, climate-change (in any direction). Try not patting one’s self on the back like the anti-war movement did with the size of turnouts irrespective of whether it actually scuttled war or not. Here, unless and until all the diabolical architectures of global governance, inter alia, carbon credit, are scuttled, “the mad faith that has cost us so many futile billions already” will not only continue to cost several times that, but also cement incremental faits accomplis through various manufactured ‘hegelian mind fcks’ longer matters linger. See: Between Global Warming and Global Governance – Concern for Environment is a ‘Hegelian Mind Fck’! U. S. Senate Minority Report: More Than 700 (Previously 650) International Scientists Dissent Over Man-Made Global Warming Claims - Scientists Continue to Debunk “Consensus” in 2008, Link to Press Release on epw.senate.gov , Download PDF Link to Full Printable 255-Page December 11, 2008 PDF U. S. Senate Minority Report ; Update March 16, 2009: Now More Than 700 International Scientists Dissent Over Man-Made Global Warming Claims ; Update December 8, 2010: More Than 1000 International Scientists Dissent Over Man-Made Global Warming Claims - Challenge UN IPCC & Gore , Download PDF Link to Complete 321-Page December 8, 2010 PDF Climate Depot Special Report. Zahir's Take: Evidently none among the pro global warming crowd, scientists and laity alike, have read these dissenting consensus among climate scientists far greater in number than those who participated in preparing the consensus 2007 UN IPCC Summary for Policymakers. See for yourself in the lengthy excerpt below what is kept hidden in the mainstream media even when it is available on the Floor of the House in the US Senate! The “United We Stand” crowd of simpletons and the credulous do not even bother to read and comprehend what is publicly available from the same sources of officialdom that create the mantras du jour in the first place. So, is there, or isn't there, Global Warming? What a Hegelian Mind-fck! My shrewd take on this question is that so long as ushering carbon credit is the principal underlying agenda of Global Governance, so long as global warming menace is the means employed by the United Nations Agenda 21 to forcibly induce changes in attitude and behavior that give preference to the natural processes of “Gaia” over human existence and human experience, so long as political will and its legalisms continue to be enacted on the core premise laid out in the Club of Rome report “In searching for a common enemy against whom we can unite, we came up with the idea that pollution, the threat of global warming, water shortages, famine and the like, would fit the bill. In their totality and their interactions these phenomena do constitute a common threat which must be confronted by everyone together. ... All these dangers are caused by human intervention in natural processes, and it is only through changed attitudes and behavior that they can be overcome. The real enemy then is humanity itself.”, the principal focus of the public's, as well as the scientists', and all the national and international political pied pipers' attention should not be on this red herring question of is there or isn't there Global Warming. The common public attention should instead be focussed on the Carbon Credit scam and the Global Governance agenda under UN Agenda 21 which is being diabolically legalized using a multiplicity of propaganda covers including the fear of Climate Change in order to lend that exercise “legal” and political legitimacy. This is what the powers that be are banking on --- our infinite capacity to not just voluntarily accept servitude, but under the right set of perception management / psychologically persuasive / pharmacological cocktails, even come to love it. Aldous Huxley had called this latter control the “ultimate in malevolent revolution”. That is the path which has been ordained for humanity by the powers that be and it is not obvious how hoi polloi can effectively counter it before it is fait accompli. Platitudes abound, including my own two cents worth. [17q] These look rather nice on paper, or from pulpits and podiums, even appear self-evident, but, in the history of civilizations that is recorded, has never come to pass en masse. In our modernity which is characterized by universal deceit, when just speaking the plain truth is deemed to be a “revolutionary act”, when false hopes and false prophets shepherd the herd to this and that form of “awakening” and run them in circles, the real ray of hope perhaps comes from witnessing the daily courage of resistance of the common man in places like Palestine. Here is an excerpt from statements of dissenting scientists worldwide which puts an immediate end to the Big lie of “consensus”. The latest version of this excerpted report is the December 8, 2010 U.S. Senate Minority Report ( http://cfact.org/pdf/2010_Senate_Minority_Report.pdf ) which updates this 2008 number of More Than 700 (Previously 650), to More Than 1000 International Scientists Dissent Over Man-Made Global Warming Claims to Debunk Fading “Consensus”. It begs the question why newsmedia, politicians, scholars, pulpits, governments, just ignore it. The self-evident answer – those who know are already playing in the shell game. And those who don't know? At least some among them refuse to know but think they know enough to write a whole handbook on it: Unprecedented Climate Mobilization: A Handbook for Citizens and Their Governments. The rest --- well, efforts like these is for their sake. Over 650 dissenting scientists from around the globe challenged man-made global warming claims made by the United Nations Intergovernmental Panel on Climate Change (IPCC) and former Vice President Al Gore. This new 231-page U.S. Senate Minority Report -- updated from 2007’s groundbreaking report of over 400 scientists who voiced skepticism about the so-called global warming “consensus” -- features the skeptical voices of over 650 prominent international scientists, including many current and former UN IPCC scientists, who have now turned against the UN IPCC. This updated report includes an additional 250 (and growing) scientists and climate researchers since the initial release in December 2007. The over 650 dissenting scientists are more than 12 times the number of UN scientists (52) who authored the media-hyped IPCC 2007 Summary for Policymakers. The chorus of skeptical scientific voices grow louder in 2008 as a steady stream of peer-reviewed studies, analyses, real world data and inconvenient developments challenged the UN’s and former Vice President Al Gore's claims that the "science is settled" and there is a "consensus." On a range of issues, 2008 proved to be challenging for the promoters of man-made climate fears. Promoters of anthropogenic warming fears endured the following: Global temperatures failing to warm; Peer-reviewed studies predicting a continued lack of warming; a failed attempt to revive the discredited “Hockey Stick”; inconvenient developments and studies regarding rising CO2; the Spotless Sun; Clouds; Antarctica; the Arctic; Greenland’s ice; Mount Kilimanjaro; Global sea ice; Causes of Hurricanes; Extreme Storms; Extinctions; Floods; Droughts; Ocean Acidification; Polar Bears; Extreme weather deaths; Frogs; lack of atmospheric dust; Malaria; the failure of oceans to warm and rise as predicted. Even the mainstream media has begun to take notice of the expanding number of scientists serving as “consensus busters.” A November 25, 2008, article in Politico noted that a “growing accumulation” of science is challenging warming fears, and added that the “science behind global warming may still be too shaky to warrant cap-and-trade legislation.” Canada’s National Post noted on October 20, 2008, that “the number of climate change skeptics is growing rapidly.” New York Times environmental reporter Andrew Revkin noted on March 6, 2008, "As we all know, climate science is not a numbers game (there are heaps of signed statements by folks with advanced degrees on all sides of this issue)," Revkin wrote. (LINK) In 2007, Washington Post Staff Writer Juliet Eilperin conceded the obvious, writing that climate skeptics "appear to be expanding rather than shrinking."